Whatever situation we find ourselves in can be a learning experience. 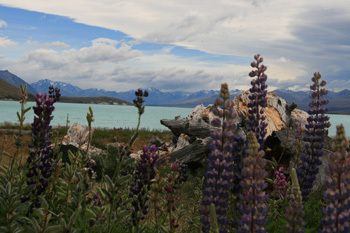 Even when patiently waiting in line for the next available stall at Lake Tekapo, New Zealand. Generally we men have no need to stand in line for such occasions, but not this day. There were four of us politely joking with one another as we waited for one of the two occupied relief centers to empty … With the major emphasis naturally based on the word "waiting". Then someone else stuck his head in the restroom. He decided he would check for other restrooms elsewhere, and then he was gone. We never saw him again. The next person to poke his head in the door announced solemnly: "You know, there are more stalls next door!" We all looked at each other, then the other three guys shrugged their shoulders and remained standing there as frozen statues. I decided to explore this new option, and sure enough, next door there were so many stalls that no waiting was required. We may think we have made it. We may really believe that we love God and others to the extreme, but in all reality, do we? We play it safe way too often. Who among us desires to live only for the needs of others? Who among us is so filled with that God-kind of love that we are ready to be possibly contaminated by the deadly diseases of others, like Father Damien and Mother Theresa? Would we measure up? Or would we be left wanting? He wanted to play it safe, and he missed the opportunity to really get to know the One who really cared for him! How many preach a humanistic kind of transformed gospel, addressed directly to the soul? "God wants you to be wealthy! Give us your money and you will have a hundredfold return!" Not a bad investment, don't you think, especially in our current economy! But this is not repentance, my friends! This is an encouragement to exalt our psuche even higher up! This has nothing to do with God, but rather, it's about "what's in it for me?" In fact the word repentance comes from the Greek word "metanoia" which means literally "meta" new and "noia" knowledge. To have that kind of "new knowledge" we need new revelation from God, or in Greek, "apokalupsis", which means "apo" remove, "kalupsis" a veil or covering. The power of repentance is closely tied to our realization of the true nature of our psuche. Only God's Holy Spirit can give us that revelation, as confirmed in His Word, and only He can lead us to taking our soulish nature to the cross. We can continue to live safely within the four walls of our exulted soul, but deep down we will continue to feel a deep emptiness. Victory will continue to be out of our reach and eternity will remain an unknown. It sure is nice to wait safely in line, but is it possible that those coveted stalls might be broken?